Neoprene Everlast vest with built-in iron and sand weight filling. Adjustable straps for ideal fit and comfort. EverGrip™ technology feature with textured panels underneath vest secures placement and limits vest movement during exercise. Exercising the body at a heavier weight than it is accustomed maximizes the effectiveness of your workout. Neoprene Everlast vest with built-in iron and sand weight filling. Adjustable straps for ideal fit and comfort. EverGrip™ technology feature with textured panels underneath vest secures placement and limits vest movement during exercise. Exercising the body at a heavier weight than it is accustomed maximizes the effectiveness of your workout. Best for strength training, total body conditioning, and muscular and cardiovascular endurance. Works to improve strength, power, and speed. Wear during strength training and other fitness routines to increase number of calories burned. One size fits most. Vest is unisex. Neoprene vest with built-in iron and sand weight filling. Adjustable straps for ideal fit and comfort. 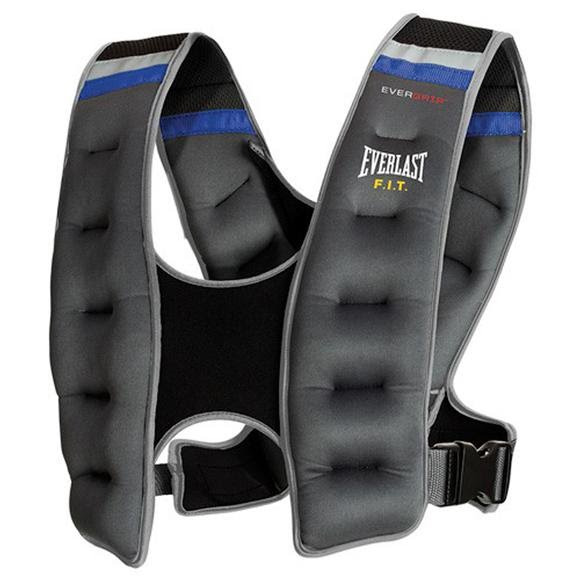 Evergrip™ boxing and training equipment technology feature with textured panels underneath vest secures placement and limits vest movement during exercise. Weighted vest is boxing and training equipment that is important in strength training, total body conditioning, and muscular and cardiovascular endurance. Synthetic technology designed for superior grip during the hardest workouts.